We are so excited for LEAP sessions to start this week, and we hope you are, too! Please read on to find out what to expect at LEAP, and what we're expecting of you and/or the caregiver attending with your child. Let your child lead the way. Most of the class will consist of free play among 6-8 different stations. Some kids might hang out at the same station for half the class filling and emptying buckets of beans, while others may run around and continuously sample each station. Watch what your child is drawn to, and then join in! Check out the theme for each class. Each week we will investigate plants and animals and the habitats they live in. Across the nine weeks, we will explore water, sand and dirt, beginning simply and adding materials each time we revisit that theme. Every week LEAPers will have the opportunity to engage with the new and the familiar, gaining confidence and comfort along the way. We will end class each week by reading a story, meeting an animal, or going on a nature walk. The themes, along with other activities and resources are on the blog, so check it out! Playing with natural materials sometimes means getting dirty, be it splashing in water, painting with sand or squishing mud between your fingers. If you and your child are dressed for a bit of paint and dirt, then you can dig right into the activities and not worry about the clothes. What would a nature play program be if it didn’t include a little time IN nature? With the Children’s Zoo all to ourselves for the first five weeks, we hope to soak up the last bit of warm weather by spending time outside. We try to set as many stations up outside as we can when the weather allows. New this year, we’ll also have activities set up at our Wild Sapling Play Forest! Occasionally, we will end class with an outdoor nature walk, rain or shine. Enjoy this special time with your child. LEAP is centered on nature play- playing in and around nature as well as with natural materials- so it's a great opportunity to take a break from technology. We’d like everyone to unplug for the hour that you’re at LEAP each week and ask that you keep phone use to a minimum during class. Explore the fun materials and the animals surrounding you, and share in your child's sense of wonder, seeing the world through their eyes. You’ll see us taking pictures each week on our program camera. We take photos so you don’t have to take as many and can focus on playing with your child. We use these photos on our LEAP blog, so check out the blog each week to see if your child is in the spotlight! We also share all the photos we take throughout the series in November, once class is finished. Feel free to chat with staff and fellow participants at LEAP, and follow the blog to learn more about nature and child-directed play, share your ideas and feedback, and get inspired to extend your outdoor and nature play experiences beyond the class. Nothing makes us happier than hearing about how you incorporate what we’ve done at LEAP together into your life at home! 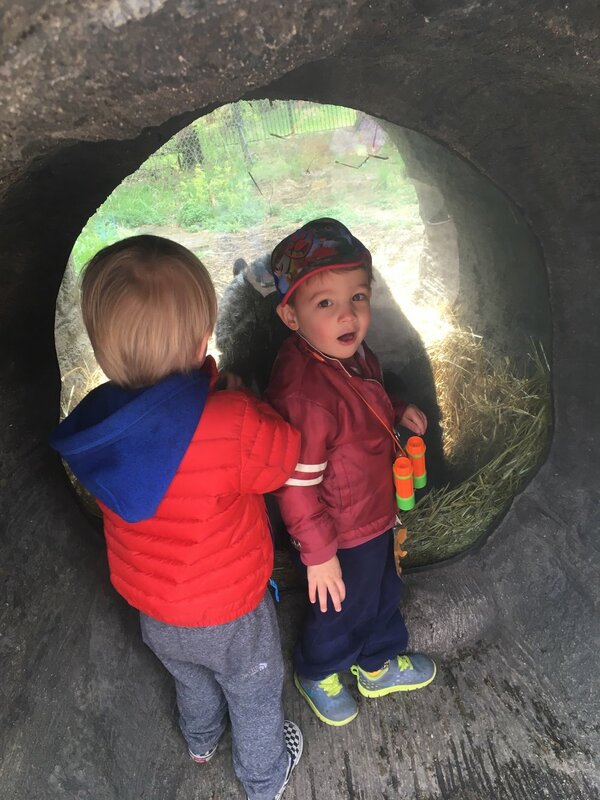 Throughout the series, we will share photos, discuss nature play and its benefits, give you some activity how-tos, and hopefully inspire you to extend your nature play experiences beyond LEAP class!